The annual John M. Prather Lectures in Biology will be presented by Edward O. Wilson, Pellegrino Research Professor Emeritus and Honorary Curator in Entomology at Harvard, and one of the world’s leading voices for conservation of global biodiversity. Wilson is one of the most influential and accomplished biologists of the last half-century. He is known for his groundbreaking research on the biology and behavior of ants, as well as his celebrated work in such broad fields as island biogeography, sociobiology, and conservation biology. He is the author of two Pulitzer Prize-winning books, On Human Nature (1978) and The Ants (1990, with Bert Hölldobler), as well as the recipient of many fellowships, honors, and awards. 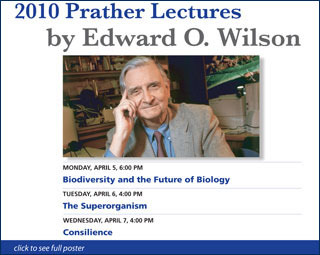 Wilson’s Prather lectures will encapsulate his remarkable 55-year career in biology at Harvard, and look forward to the critical challenges ahead. Global biodiversity is richer than thought even 20 years ago, but it and the ecosystems supporting it are disappearing at an accelerating rate–to the great and enduring loss to future humanity. Science is not well prepared to handle this issue. We live on a poorly explored planet: only a tiny fraction, probably fewer than ten percent, of species are known to science, when microorganisms are included; and of these, only a minute fraction have been studied at any depth. There are remedies to this ignorance, and when they are applied, a major new front of biology will open, equal and complementary to molecular, cellular, and developmental biology. Location: Sanders Theatre at Memorial Hall, 6:00 PM. (Reception and booksigning to follow at the Harvard Museum of Natural History.) Lecture tickets are required, and can be obtained through the Harvard Box Office in Holyoke Center beginning on March 3. $10 – general public/ Free to HU ID holders. The study of insect societies is today one of the fastest growing major branches of evolutionary biology. It has revealed a great deal about the general principles of the origin and evolution of advanced social behavior, and has shed light on the enormous ecological success of the social insects (with ants and termites making up over half of the insect biomass around the world). The evolution from organism to superorganism has been the major transition between levels of biological organization, easiest to penetrate and understand. Location: Science Center, 4:00 PM. Free, advance tickets not required. The John M. Prather Lectures in Biology were founded in 1939 by a bequest of $25,000 from John McClellan Prather, A.B. in 1894. The annual income of the fund is to be used to pay for the services of eminent lecturers on botany and zoology alternatively. The Prather Lecture Series on Biology is sponsored by the Department of Molecular and Cellular Biology, the Department of Organismic and Evolutionary Biology, and the Science Center Lecture Series.